Mediterranean Energy Perspectives 2011 provides insights into the energy situation today and over the next two decades in the Mediterranean region. Its detailed data and analyses are of interest to stakeholders on both the supply and demand sides of the energy equation. This is the third edition in the MEP series which highlights the extensive work of the Observatoire Méditerranéen de l’Energie (OME). This outlook draws upon the extensive expertise of the OME and its members. 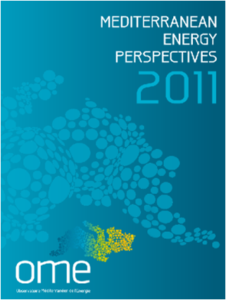 MEP 2011 provides a unique and comprehensive analysis of the energy sector in the Mediterranean. It presents data ranging from the early days of the region’s energy industry to the situation today and an outlook to 2030 based on OME’s supply and demand model, the Mediterranean Energy Model. Current efforts related to renewable energy sources and energy efficiency are carefully considered as they are key issues for the Mediterranean energy sector and for the whole economic and environment future of the region. A description of the Mediterranean countries in a global context. Historical and forecast data on the supply and demand balance for each segment of the Mediterranean energy sector. Energy demand to 2030, including two cases: the Conservative and Proactive Scenarios. Trends in past, present and future oil and natural gas production and development. Existing and planned oil and gas infrastructure. Evolution of electricity generation and installed capacity. Developments in innovative and renewable energy sources. In-depth analysis of energy efficiency measures and policies. Prospects for CO2 emissions and sustainable development. MEP 2011 has been prepared by a joint-team of OME experts supported by related companies and independent expertise. Bringing this expertise together provides an important reference for industry analysts and investors who wish to get a complete picture of the energy industry and markets in the Mediterranean, the way they operate and their long-term perspectives. Because its forecasts can be easily compared with outlooks available elsewhere, MEP is an indispensable source for policymakers, researchers and members of the business community.